When kids are growing up, parents often ask them “what do you want to be when you grow up? Parents are so proud when a child responds “doctor, lawyer, engineer, etc.”. I take a slightly different perspective on this issue. When I ask this question to my kids, the only response that I am anticipating is “Jennifer Lawrence’s agent”! Last weekend, my daughter, one of her friends, and I entered the incredible dystopian world of The Hunger Games: Mockingjay, Part 1, as did $123 million dollars worth of attendees at movie theaters around the country this past weekend. Like all great sagas, the pre-release hype was off the charts. And why should it not be so? 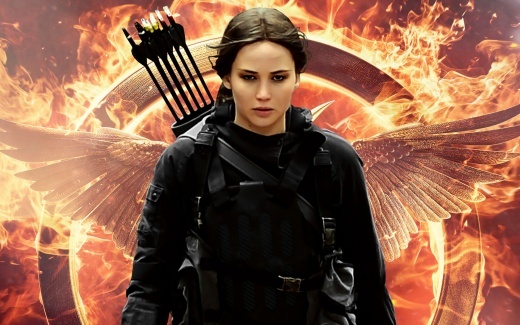 “The Hunger Games” and “The Hunger Games: Catching Fire” were epic, captivating audiences around the globe. Before we review this movie, a few points have to be made perfectly clear. In “The Hunger Games” saga, Jennifer Lawrence “is” Katniss Everdeen; she literally morphs into her. That is what makes her so special. The viewer is enamored by this girl next door heroine, who traverses the emotional gamut from stoic to hyper-emotional from one scene to the next. The camera focuses as much on JLaw’s freckles as her face, continuing to emphasize that she is just a very normal young lady caught up in a chain of events of which she has little or no control. I am hard pressed to remember a young star bursting on the scene with this much critical acclaim since Dakota Fanning, whose flame has unfortunately seemed to flicker out in the past few years. Note: In 2012, there was a Female Superhero as part of a group in a successful movie, e.g. Scarlett Johannson starring as Black Widow in the 2012 “Avengers” movie directed by Joss Whedon. But this was not a stand-alone leading role. One very intriguing portrayal of a quasi-Female Superhero was the Joss Whedon production of “Serenity”. Resurrecting his 2002-2003 cult classic TV series, “Firefly”, Whedon directed the movie “Serenity” in 2005, managing miraculously to reunite the entire original “Firefly” cast. During the entire TV series, River Tam, portrayed by the quirky Summer Glau, hints at having superhuman abilities, but never quite reveals her exceptional talents. It isn’t until the climax of “Serenity” that River Tam bursts out of her shell and single-handedly defeats a host of Reavers (cannibalistic barbarians) in an epic battle scene. Note: Summer Glau appears to have continued to have super powers on three TV series: as a lovely female terminator/android, Cameron Phillips, on “Terminator, The Sarah Connor Chronicles”; as, Skylar Adams, a gifted human with telekinetic powers on “Alphas”, and finally as a mercurial vengeful psycho, Isabel Rochev, on “Arrow”. With that sort of typecasting, it makes one wonder if she really has some special powers! The first thing you have to recognize before entering the theater is that the “actual Hunger Games competitions” are history; no more groups of teenagers (with a few adults mixed in) stalking weaker opponents”, often with our favorite character mercilessly eliminated by one of the purely nefarious participants in the games. In The Hunger Games, the slaying of Rue is the most heartbreaking moment in the entire feature and the climactic moment in the first segment of the saga. When Katniss signals to the population of District 11 her respect for Rue, the real story officially begins! To add a special dimension to this traumatic event, one could hardly have picked a more endearing actress than Amandla Stenberg to play the part of Rue! The second thing that you must realize before purchasing those tickets, is that, just as in Twilight Saga, Breaking Dawn Part 1, Mockingjay, Part 1 is a penultimate movie, with limited action, most likely with a cliffhanger type ending, unsatisfying at best. The worst part of it all is that we now must endure waiting a solid year to have our insatiable appetite for the dramatic conclusion of The Hunger Games to be sated. While the action in Mockingjay, Part 1 may be less than prevalent, this film clearly has its moments. The hospital scene announces to the world that Katniss has been anointed the “Mockingjay”, the symbol of the rebellion. This scene is very powerful and has a major effect on the viewers. Later, when Gale and Katniss face off against the Capitol warships, the war has officially begun. Philip Seymour Hoffman escalates his role of Plutarch to a new level, while Julianne Moore joins the cast as President Coin of District 13, the headquarters of the rebellion. While Coin and Katniss buck heads in Mockingjay, Part 1, Ms. Moore might have enhanced her performance by animating her character to a higher level of “bitchiness”, in order to more appropriately represent the character in the novel. She caves in to Katniss far too easily in the film. Gale remains a very subdued “boyfriend/hero” in the film, who is certainly not ingratiated to the audience by Liam Hemsworth’s stilted acting. I found it very difficult to sympathize with his plight, i.e. that Katniss is far more concerned about Peeta’s plight than about Gale’s feelings. Elizabeth Banks continues to enamor the viewers with her sensational and semi-comical portrayal of Effie, clearly the most lovable character in all the films. With or without her wigs and make-up, she is an absolute pleasure to watch. Sam Caflin’s reenactment of his role of Finnick from “Catching Fire” seems very subdued. Jeffrey Wrights steps it up as “Beetee”, while Donald Sutherland retains his “aura of arrogance” as President Snow. Woody Harrelson’s efforts as Haymitch are fine, but his role had clearly been diminished in this segment. Finally, Stanley Tucci continues to be as irritating as ever as the talk show host “Caesar”. In my opinion, the most difficult problem with the cast from the onset was the selection of Josh Hutcherson for the role of Peeta. From The Hunger Games to Mockingjay, Part 1, it has been very difficult to embrace Mr. Hutcherson as Peeta. He is not a particularly gifted actor, rarely eliciting the type of empathy that Peeta merits. His portrayal is bland and affected. His feeble attempts at romancing Katniss never quite make it, and he never seems to evolve into a genuine hero. Of course, all of these performances by the supporting cast are escalated to magnificent heights just by the presence of Jennifer Lawrence as Katniss Everdeen. All by herself, she makes the film a veritable must-see. Certainly, there will be an audience segment that will procrastinate for a year to view this movie until the release of Mockingjay, Part 2, preferring to see both Part 1 and 2 together for story continuity. However, for the true fan of the saga, one would rather see Mockingjay, Part 1 now and then watch it one more time just prior to the premiere of Mockingjay, Part 2, because it is that enjoyable. We live in a world of turmoil, hatred, and prejudice. There are leaders as pernicious as President Snow in half the countries around the globe. War is imminent in the Middle East where Hamas, Hezollah, and Al Qaeda expand their influence from day to day. The Taliban are so close to Islamabad that nuclear weapons could be in the hands of terrorists by tomorrow morning. “The Hunger Games” is such a successful franchise partly because, in this time of despair, we all need hope. We all need Katniss Everdeen to lead us into the future. We can only hope that she is out there somewhere.